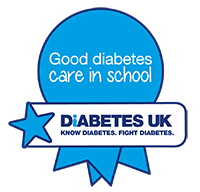 Congratulations to the Good Diabetes Care in School Award holders in the South East and home countries, Diabetes UK officially recognises that these schools deliver effective diabetes care and management. View the winning schools in the South East and home countries below, and view the national winners on ourhonour wall. This particular school have taken on board all aspects of my daughter's care and is never excluded from activities. They overcome any hurdles offering fantastic support along the way. 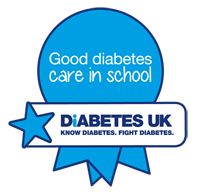 The school have always been very receptive and open to having regular diabetes training. As a parent and qualified nurse, I am overwhelmed with the standards of care and support we receive acorss the board from the entire school. Good communication between school, PSDN and parents. They have been great, couldn't recommend enough. The teachers had to learn it all and they have been fantastic and have taken in everything I have shown them. The school let me be involved for as long as I wanted, and this is very comforting for a parent because you get to know how your child is coping at school. I feel the teachers thoroughly deserve the recognition for just how brilliant they are. I feel very lucky that my son goes to such a fantastic, dedicated school and would love them to be recognised with this award. It has been a huge step (as it is for any parent) for us as parents to be able to trust 'others' to care and deal with daily tests and injections and I must say all teachers and assistants have been amazing and made the process as stress free as possible. I am very impressed with all they have done for him and to how well he has adapted and how well the school has dealt with all aspects of his Type 1 diabetes. Over the Moon! I feel the school should be recognised for the care and suppoty they offer to children with diabetes to ensure they can still learn and achieve. I am very satisfied with the level of care my child recieves from the school on a day-to-day basis in order for him to control his diabetes. I could not have asked for more from the staff. The day to day care is exceptional. Onboard with the training and taking on the responsibilites involved. Communication has always been a two way thing and brilliant. They have made the transistion from home care to that provded by the school as easy and stressfree as possible. They are constantly adjusting to the ever changing needs of a child growing in confidence and indpendence. The staff at the school are amazing. I cannot fault their enthusiasm, thoroughness and exceptional care. The support staff are amazing! Their positive attitude is infectious. When we hand the boys over in the morning we feel 100% confident they are in safe hands. This school has three children with diabetes and they always make sure these children are included in everything and don't feel 'different'. Informs all teachers of child's medical conditions and their needs. The young person is incluced in all school activities and school staff support her wishes in relation to organising awareness and fundraising events for Type 1 diabetes. My son thoroughly enjoys boarding, he feels safe and secure knowing staff can look after him competently. The best thing is that he is able to attend boarding school where he is fully supported 24/7, and knows that no matter what time of day or night his houseparents will come to him if he needs them. My daughter left school, a confident young lady, with excellent exam grades, all of which could not have been achieved without the support and care offered to her from the age of 9-16, from members of staff and students at Lavant House School. The school has been very responsive and supportive. Thameside have made sure from Day 1 that Type 1 diabetes is not a problem. With the help of the school, my son was able to return just 4 days after being discharged from hospital and was given the chance to explain to his class what diabetes is and what treatment he needs. The school has excellent communication with parents on all aspects of the students diabetes. The school has been wonderful towards supporting my child in every sense. The school nurse is always contactable if needed. The school have continuously worked together with the family, the children and the staff. The standard of diabetes care and management in the school is commendable. The child always feels safe at school and there is always someone, somewhere to go and see if they are worried. This is a special needs school and my son is a residential student during the week. The level of care provided for my son, particularly regarding his Type 1 diabetes is equal to the care provided at home. I can trust the school 100% to care for my son. The school has been very interested in engaging with the families and the diabetes team about the training, care planning and establishing an environment that caters for the children's individual diabetes needs. The support my daughter receives from school when she has a hypo or hyper is excellent. Information is shared with new teachers and the first aiders have a very good understanding of blood glucose levels and make sure she is well before she returns to class. She has been on numerous trips with the school. The school treats each pupil with diabetes as an individual. As a school they are extremely supportive, if any of the girls experience difficulties with their diabetes and respond appropriately. The school is brilliant with the care of my daughter. Her needs are always met plus more, so I can rest easy knowing she is well cared for in school. The care in school means that I am happy, she is happy and the school is happy. The school has formed good relationships with the student with Type 1 diabetes, making them feel well supported in school. The school is proactive in contacting the diabetes team. Day to day care is excellent. The staff will always contact me with any questions or concerns. Nothing is too much trouble and I feel my son is left in safe capable hands. The school has developed an excellent communication system between staff administering insulin and testing blood sugar levels. As well as keeping parents informed of any issues during the day. They have good communication with diabetes team; seeking updates and further training as needed. A school assembly was arranged to talk about diabetes, my child's school nurse was invited to speak to the children. There have been class discussions over the years so all her classmates over the years are aware of her condition. School staff care for child when feeling unwell and/or having hypos competently making child feel safe in school environment. The school has a designated room where children with with diabetes can go if they wish. There is ongoing training available for the staff. My child has never been excluded from joining anything. The school nurse is very experienced. She has excellent rapport with the students with diabetes, their families and staff. Our son was the first child to attend this school and have Type 1 diabetes. From the first day we were at ease, all his needs were met. The school asked for as much training as possible and support has not stopped since day one. The staff at the school provide an immense amount of support to their pupils with diabetes, from help with their medical equipment to administering insulin and carb counting. The school provided amazing care from day one. I couldn't fault the school and my son is part of everything that goes on at the school as any other child. The school has a dedicated team who support the children in the school; care plans are reviewed and updated regularly as is training. The school listen to individual need and preferences regarding the students diabetes management. The best part of the school care is that the school are aware as a whole, but at the same time Type 1 diabetes doesn't define him as a child. His blood sugar and insulin are all done but a big deal is not made. His hypos are treated without fuss and he does not miss much school. The school is dedicated to providing safe, effective care working with the family and diabetes team. Their priority is the child and trying to achieve optimal management. They support the family and ensure the child is involved with all aspects of school. They go above and beyond to support the family and ensure blood glucose stable to help make managements at home after school easier for the parents. Overall, very caring and supportive environment ensuring all opportunities are available to the child. My daughter was diagnosed six months ago. It was extremely difficult to receive a life-changing diagnosis right at the start of her school journey. However the school immediately put a plan in place to ensure that her education was not interrupted and she was not made to feel different. She feels safe and cared for. The school have been very supportive with the day-to-day care. There is always someone on hand for lunchtime blood testing and injections and any inbetween testing. Also extra care is taken when school trips are organised. My daughter has been encouraged to continue to be active and get involved in the activities she enjoys. They don't let her diabetes stop her from doing anything, including taking part in rock challenge representing the school and running. They help and supervise her on a daily basis, listening to her and how she is feeling and contacting me for advise. They have always listened closely with the diabetes team to ensure that everything is done to ensure the child felt supported at the school. The school staff are very confident in my daughters day-to-day care. They take a genuine interest in learning more about the condition and how blood sugars react in different situations. They are able to pre-empt possible low blood sugars through additional snacks (as agreed with us and DSN). Staff maintain an appropriate balance of respect for the potential severity of complications whilst ensuring that she has full access to the provision at school.The school actively engages with us as parents and we are always kept fully informed of any actions taken. Her diabetes is not hidden and any questions asked by the other children are answered so that they too have an age appropriate understanding of her needs. The school has been a stable base and consistent care has been carried out. They have taken on learning and developed the care as necessary throughout the year. They have given confidence to the child and made her feel safe within the school environemnt. They have supported her changing needs and enabled her to fit in with her peers without feeling different from the other children. They have encouraged questioning from the other children which is vital for acceptance in the peer group. The school has gone from knowing very little about diabetes, to being able to care for the child in a very short period. We have adapted his management and he takes part in swimming and school trips. We feel confident sending him to school. The school have supported the child's change in therapy from injections to a pump and continue to support the child to manage his diabetes as independently as possible for their age. Nothing appears to be too much trouble for any of the staff to help support the child in their diabetes management. The school has been inpecable in ensuring sufficient staff are trained to support my son's needs both with delivery of medicine and with monitoring his condition. When on trips outside of school a trained member of staff is always on hand if needed. Longwick school staff have ensured that they have planned for all the childs requirements to manage and support this child with diabetes to an optimal level. Staff are trained in insulin administration, carbohydrate counting, blood glucose monitoring, hypo management and hyperglycaemia management. Ongoing diabetes training is requested by the school each year . Equipment is safely stored and accessible to the child. Staff have been keen to learn about all aspects of diabetes management to enable integration of the child into the school curriculum. From the school head to the TA's they totally embraced the challenge, from injecting a 5 year old to now learning about his pump and CGM. We were, and continue to be, impressed by the schools' attitude in ensuring our son's diagnosis doesn't exclude him from anything at school. Diabetes was new to this school when the pupil started in Reception. They recognised that there was a need for several training sessions and they were willing to free up the staff to attend as many sessions as were required for them to feel confident in managing this competently. Transition arrangements from one school year to the next are good with the staff making sure that the staff are supported by the previous years staff until confident. They never panic when my son's blood is high or very low. They always keep me updated and if they're ever in doubt they'll contact me and the diabetic team. This school has cared for 5 children with Type 1 diabetes (4 in one year). Every child has been cared for as an individual and encouraged to try new things. The nurse was a great support to us after initial diagnosis and discussed the daily process and options so that the transition was as easy as possible. The Head was very understanding of our dilemma regarding food and carb counting and asked for assistance on our behalf. This school have worked particular well with the family and the Paediatric Diabetes Team to ensure things are put in place to support the child/young person managing their diabetes safely during the school day. The school has been outstanding. It is a huge relief the care in school is so good and my son is so well looked after. School are very good at listening to families' needs and concerns and will act on parents' advice as well as health care professionals' advice. They have been so very supportive of myself and my daughter. Nothing is too much trouble. My daughter is never made to feel as though she is bothering anyone. Knowing that I can send her to school and not have to worry is a huge weight off my shoulders. The school is always very forthcoming to provide staff training and organise when when additional training is required. The school also organised for the diabetes team to provide a class assembly to explain about diabetes to the children in the child's class. The school has been so supportive during this really difficult time and me and my husband feel secure in the knowledge that my daughter is safe and well cared for while she is away from us. The school is enthusiastic and proactive. They always want to problem solve. They listen to the parents' needs and wishes.